My lack of morning aptitude is well-documented in this blog. See: helpful habits for non-morning people and 6 shortcuts for easier mornings. On the days that I oversleep — there are so many, y’all — and give myself 20 minutes to get ready, I depend on this easy 5 product makeup look to get me fresh-faced for work in 5 minutes. It’s a “no makeup makeup” look that’s all about warmed-up healthy skin and a subtle glow. The trick to this 5 product makeup routine is to find good multitasking products that can perform different tasks to save you time. 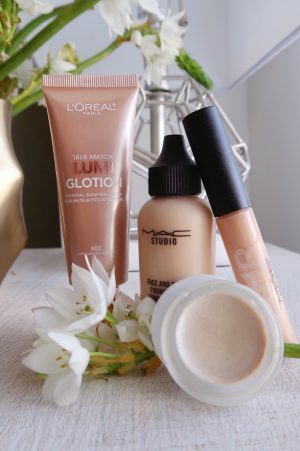 I rounded up my favorites and broke down the steps, so if you’re looking for ways to streamline your morning routine, new to makeup, or interested in paring down your cosmetics stash, give this simple look a try and tell me what you think! 1. Color-correct and protect skin in one step with an all-in-one BB or CC cream. 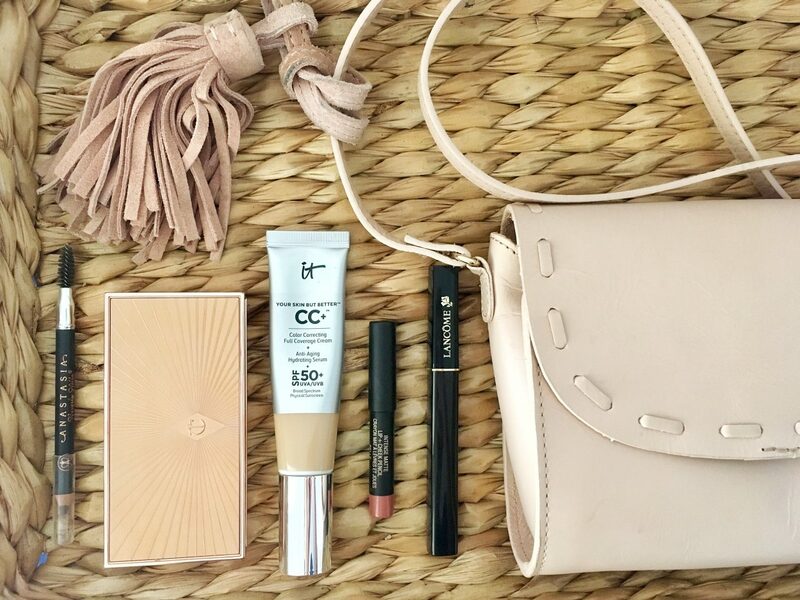 When I’m doing a minimal makeup routine, I usually reach for It Cosmetic’s bestselling full-coverage CC+ cream with SPF 50. It knocks out three steps for me in one go: priming, color correction, and sun protection. It has really impressive coverage while still looking like skin, and contains a good blend of antioxidants and anti-aging ingredients to improve your complexion as you wear it. This product claims to be really hydrating, but I find I usually need a moisturizer underneath for it to wear comfortably all day. When I’m finished with my morning skincare routine (more on that really soon) I warm up 1-2 pumps in my hands and apply it with my fingers all over my face and down my neck. Since I skip concealer in this routine, and this CC cream has such good coverage, I add a little extra under my eyes to camouflage dark circles. 2. Warm up the face and add a little glow with a bronzer/highlight duo palette. I splurged on the Charlotte Tilbury ‘Filmstar Bronze & Glow‘ palette on a night of too much wine and YouTube makeup tutorials, and it’s one of the best beauty investments I ever made. The bronzer is a perfect “naturally tan” shade for my light skin, and the champagne highlight gives just the right amount of daytime glow without looking too shiny or glittery. The finely-milled powders blend easily into whatever base you’re using, so it’s perfect for quick applications, and it never looks patchy or streaky. I use this $10 drugstore brush to sweep the bronzer onto the high points of my face where the sun would naturally hit: on my cheeks and temples, along my hairline, and down the bridge of my nose. (Check out this helpful post from The Beauty Department for tips!) Then I use a fan brush to dust the highlighter onto the tops of my cheekbones and cupid’s bow. Prefer a budget-friendly option? I’ve seen great reviews on the $6 e.l.f. contour palette, and Physician’s Formula makes awesome bronzers and highlighters that you can purchase separately but use the same way. 3. Use the same palette to shade and define the eyes. This routine is all about multi-tasking products, so put that duo palette to use as an eyeshadow! I do a quick “color wash” all over the lid with the bronzer shade and a fluffy brush, then take the color along my lower lash line with a smaller definer brush, and blend out all the edges for soft, smoky definition. Then I use my fan brush to dust the highlight shade right onto my brow bone — keeping it close to the bottoms of my brows — and use my fingertip to gently smudge it into the inner corners of my eyes for an instant eye-brightening effect. 4. Pile on the mascara. This step kind of goes without saying, yeah? My current favorites for seriously oomph-ed lashes that never flake or smudge are Diorshow and ‘Extreme Ecstasy’ mascara. My top drugstore pick: this carbon black mascara under $6. 5. Fill in your brows with an easy-to-use pencil. Taking a few minutes to define your brows makes a huge impact in looking pulled-together. I love my go-to ‘perfect’ brow pencil for naturally definining the shape and filling in any sparse spots. It’s waxy, so it also helps tame any crazy hairs and hold them in place. If you’re kind of new to filling in your brows, a skinny retractable pencil is a great option for more precision and control; this drugstore brow stylist definer pencil is a good place to start. If your brows are naturally full, you could use a tinted pomade or gel instead. I love Glossier’s Boy Brow as a one-step brow tamer. 6. Finish up with a multitasking lip and cheek product in a natural shade for a dose of healthy color. Real-talk: most of the products that claim to work for both cheeks and lips are kind of terrible. They either work on cheeks but are too dry and chalky for lips, or look great on lips but are too greasy and smeary for cheeks. This dual-action lip + cheek pencil was one of my favorite beauty finds of last year. The creamy pencil formula comes in a range of natural shades like nudes, peaches, corals and pinks, is long wearing, and contains some good-for-your-skin ingredients. It’s also perfectly portable to toss in your makeup bag for travel or everyday touchups. I’m wearing the ‘blush’ shade in the above photos, which is almost the exact color that I naturally flush, so it’s a great “no makeup makeup” match. If your skin is oily-to-combination, or you want this look to hold up through an entire work day, you’ll probably need to set your trouble spots with a powder to control shine and help the CC cream stay put. I’m newly obsessed with MAC Mineralize Skinfinish Natural (I’m in the shade Light Plus) because it has just the tiniest bit of glow and never looks powdery or chalky. I’ve been curious about the ABH Brow pencil. I use the Dip Brow Pomade and I enjoy it, but pencil seems nice for quick-routine mornings! OMG I love the IT CC cream😊 it has great coverage and has great skin and anti aging properties. Thanks for sharing your tips! Will deffo try this CC Cream. This is awesome! Thanks for the share! Will be back for sure! I will be coming back to this ,you have such learning blogs ! Thanks for sharing Keira ! You’re so kind, thank you! I want to try that concealer. I got a sample from Sephora but they sent the wrong shade. The sample for me came in one of those subscription boxes that I have…lol I have three different ones coming so I can’t remember which one it came in lol. OMG this made me snort-laugh. I have been looking for a good bb or cc cream to try. I will have to check out this it cosmetics one you used, your skin looks flawless! Thank you, Lauren! I’m definitely more of a skincare than makeup girl. I think you’ll enjoy this product. I’ve found it works best when I apply it with my fingers and really rub it in like a moisturizer. Otherwise it can tend to look a little heavy (like when I use a beauty blender or brush). Thank you, Roberta! I find that this pencil gives the most natural-looking definition, next to powder. It’s so easy to work with. What is that adorable cream/tan bag in the photo? It’s a Zara find from a few years ago. :) I’m so into blushy-beige tones lately!